A trend I see gathering more and more steam these days is that of snazzy marketing campaigns for (mostly) new rums, bugling their lovingly preserved family recipes, boasting slick webpages oddly short on facts but long on eye candy, trumpeting old traditions made new (but respectfully adhered to), or new and innovative production methods which enhance the final product. Words like “artisan”, “premium”, “handcrafted”, “traditional”, “every single drop” are tossed around with the insouciant carelessness of hormonal teenagers with their chastity. This kind of folderol just irritates me, not least because it seems like such a copout, a lazy substitute for the actual product. 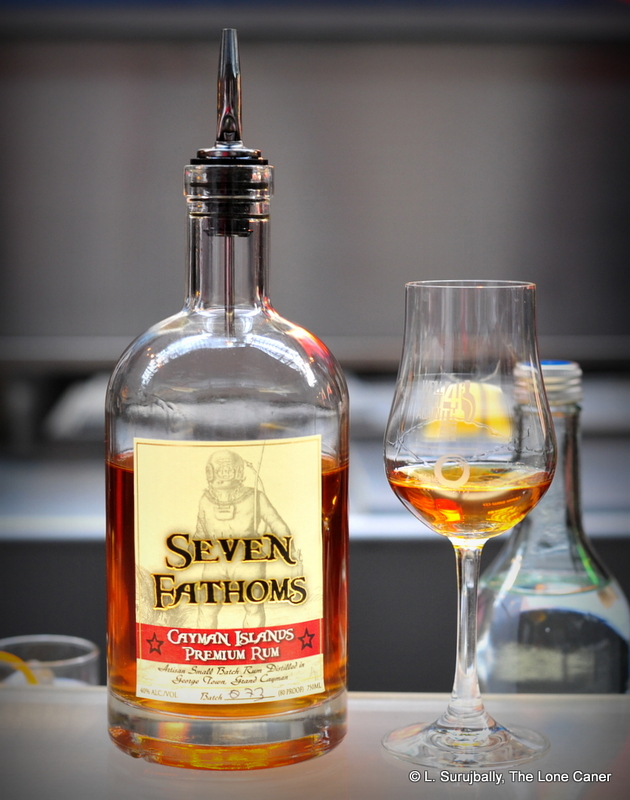 Seven Fathoms, which is going for that last category, is staking its claim to fame on the fact that they age their rum in watertight barrels that are weighted down and put under water (42 feet deep, or seven fathoms, get it? ), so that the action of the waves agitates the barrels and increases contact between rum and wood…which, with the additional pressure, thereby making for a denser flavour profile in somewhat less time. Ageing seems to be around one to three years depending on the rum. Whether that works or not is questionable. I can accept that it likely has an effect, but whether that effect has such an impact as to elevate the whole rum to some other level of quality on the basis of claims alone is something like accepting statements of superfast ageing, or proprietary yeast strains, or family recipes from Ago, or the impact of Tanti’s enamel bathtub as a finishing agent. Kinda have to go there and try the thing, y’know? So let’s do that: it was an amber-red rum, bottled at 40% and aged less than five years. It smelled, on the initial pour, rather spicy – sweet and fruity, with apricots, cherries, pears and some vague breakfast spices, and with a noticeable background of orange zest (this is where the reference to Pyrat’s comes in). While most of my research suggests that it was of pot still origin, the scents lacked some of that pungency and depth which would mark it as such with more emphasis. Still, quite a decent nose, and if not world beating, at least it was aromatic. The taste was clearer about the origin and also quite original in its own way. It was not quite full bodied, but spicy and smooth enough to please. Cucumbers soaked in brine and vinegar (I know how that sounds), ripe tomatoes (wtf? – that’s a first for me) and molasses, bound together by a core of caramel, nougat, peaches and other lighter fruits, sugar water, vanilla and the slightly bitter oak tannins imparted by the barrels themselves. I noted with some relief how well the orange zest that carried over from the nose had been integrated into the whole, lending just enough spritely shuck and jive to enhance without overwhelming the drink. It was a beguiling mix of soft and spice, done well, leading to a finish that was warm, a little dry, providing closing aromas of vanilla, crushed almonds and some oak tannins. All in all, quite serviceable for a young rum. The Cayman island Spirits Company has been in business since about 2008 when they operated out of a small building in George Town (on Grand Cayman), and in 2013 they moved to a spanking new facility as part of their efforts to expand, diversify and launch an attack on the global market. They began back in the day with a handmade still apparently constructed from two ice-buckets welded together, but have since progressed to both a pot still and a column still, and produce the Seven Fathoms premium, as well as a series of “Governor’s Reserve” Rums – white, overproof, gold, dark, spiced, banana and coconut. Oh, and a vodka. And a gin. The rum derives from local sugar cane (which a brand rep told me was “as far as possible” which I took to mean “not all of it”). The distillate comes from refined sugar and molasses fermented for six days in 4000-liter stainless steel tanks and is double distilled in a German-made copper pot still. Then it’s barreled off into ex-bourbon barrels, which are themselves sealed in a sort of Texas-sized condom (the process is actually patented, or so I was informed), and taken out to sea somewhere secret to be submerged. Note that I’ve read the ageing is not 100% underwater but I don’t know how much is terrestrial and how much is aquatic at this point. Summing up: my take is that they’ll find Europe a tougher nut to crack than the US, where younger 40% rums tend to be viewed with somewhat more favour and so sell better (and that’s not counting island-hopping tourists who stop off on Grand Cayman). Be that as it may, here is one rum that tries to go slightly off in a new direction without entirely abandoning what a rum should be, and I’m happy to report it’s not bad at all. This seems to be one of those instances where if you filter out the noise and rah-rah of the advertising, put away the key individualistic selling point of the ageing regimen, ignore the near-hysterically positive notes on TripAdvisor and other sites – do all of that, take it all down to its essence, and what’s left is still a rum which you won’t be entirely unhappy buying, and sharing.